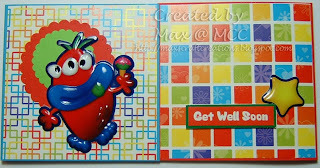 This card and matching notebook was made for a brave 15 year old young man called Andrew, who has recently had major foot surgery, (one of many surgeries over the years), and is now at home recuperating - probably driving his mum daft into the bargain. His mum put out an appeal in the hope that we crafters would help keep his spirits up during his recovery time, which I understand is about 6-8 weeks. To read the background and get updates on Andrew's progress CLICK HERE. 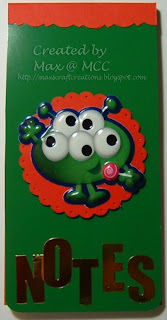 As there was a special request not to send cards showing boys being active in consideration of his condition, I decided to dig out some junk food monster stickers ... according to his mum he's a "see food and eat it" kinda' guy! ... and I also included some sweet treats in the parcel for him to munch on. This is fantastic Max - love what you've made. I'm sure this will be really appreciated. 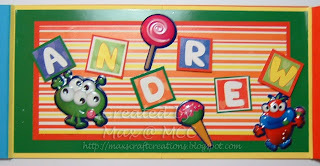 Max, your card is great, and definately suitable for Andrew.